The word unicorn comes from the Latin for "one-horned" and refers to an imaginary beast that appears in the legends of China, India, Mesopotamia*, and Europe. Since medieval times the unicorn has often been portrayed as a horse with a single horn growing from its forehead. Descriptions of the animal in various sources differ somewhat, but they all agree on the horn. Some images of unicorns were probably based on real animals, such as the one-horned rhinoceros or the narwhal—a small whale with a single long tooth or tusk that resembles a spiral ivory horn. In Chinese tradition, the unicorn was one of four magical or spiritual creatures—along with the phoenix, tortoise, and dragon—that were regarded as signs of good fortune. The appearance of a unicorn signaled the birth or death of a great person; one was said to have appeared when Confucius, a famous wise man, was born. The Western image of the unicorn comes in part from the Hebrew Bible. During its translation into Greek, a Hebrew word for "wild ox" was changed to a Greek word that people interpreted as a reference to either a unicorn or a rhinoceros. Around 400 B.C. , the Greek historian Ctesias wrote of a wild beast in India that had a single horn and fought elephants. It was probably the rhinoceros, though later writers developed an image that much more closely resembled a horned horse. Unicorns are imaginary beasts that appear in legends from China, India, Mesopotamia, and Europe. 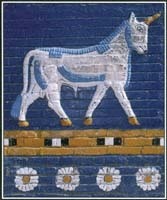 This image of a unicorn is located on the Babylon Gate, one of the eight fortified gates that enclosed the ancient city of Babylon. and powders said to have come from unicorns. Some kings, fearing that rivals might try to poison them, drank from vessels that they believed to be unicorn horns. Although unicorns were thought to be fierce fighters, they were also symbols of purity. Perhaps this was because the ancient Greeks and Romans had associated them with virgin goddesses such as Artemis, whose chariot was said to be drawn by eight unicorns. According to tradition, one way to capture a unicorn was to send a very young virgin into the forest. The unicorn would be attracted to her and would rest its head in her lap, at which point a hunter could catch the animal.